One of the unique features of LABBB is that all of our programs are located in public schools. This has been our philosophy for over 40 years. This is a big draw for many parents and districts that hear about us. Most parents want their son or daughter to be part of the least restrictive environment (LRE) and have the opportunity for inclusion in regular education, with the ability to take mainstream classes. As you know, many of our students are integrated into mainstream classes each year. Furthermore, LRE is a best practice in special education, and it is part of the Department of Education’s special education laws and regulations. Research shows that students who are included have more successful outcomes in life. A significant amount of research has also been published concerning students on the autism spectrum and students with intellectual disabilities who obtain a post-secondary education. Studies have concluded that students who obtain a post-secondary education set higher expectations and develop better work skills. Of course, this may not be true for all of our students, but we do have many students who would benefit from the LRE. I first learned of the Inclusive Concurrent Enrollment (ICE) grant in 2008. It seemed like a good partnership opportunity between some of the students in LABBB and Middlesex Community College (MCC), located in one of our member districts. Over the years, many LABBB students have expressed the desire to attend college. In the past, we have had students take a college course while they still attended LABBB, and we assisted them in applying to colleges. One student stands out in my mind. He struggled significantly in social situations, but he thrived academically and we supported him taking a class at MCC. He was extremely independent and we made the arrangements with the district to make this happen. With the blessing of the district, he took time out of the school day to attend a math course at MCC. He was very successful at MCC. Since then, we have had many graduates from LABBB transition to college full time or part time. The first condition for eligibility for the ICE grant was for a district to partner with a college. In response, I made a few calls to Middlesex Community College, but they were not interested. Fast forward to 2013; we were fortunate to have a very bright, articulate, and passionate parent who called the president of MCC and went to the state house to advocate for the ICE program to be implemented at MCC. Her name is Ann Guay. Her son, Brian, attends our Bedford High School program. Her story about the ICE grant is amazing. I will write about this another time, as it is a story of a student advocating for themselves and going from the most restrictive placement to college. It is proof that we need to take risks and not be afraid to fail; otherwise, we will never know the true potential of our students. In fall of 2013, I received a phone call from Denise Oldham, who was the Director of Special Education in Bedford. She asked if LABBB wanted to be part of the ICE program. The President of MCC, Carol Cowan, announced that Middlesex would be part of the ICE program, and they contacted Bedford Public Schools to become a partner. What an opportunity for our students! I immediately responded, “Yes, absolutely.” Denise, seeing the opportunity for a collaborative to facilitate the ICE program for five districts, invited me to a meeting to discuss LABBB’s involvement. We met with Jon Sills, Superintendent of Bedford Public Schools, and he gave it the go-ahead. We then brought this to the LABBB Board of Directors and they unanimously supported LABBB moving forward with this grant. LABBB was now included as a partner on the grant and we had a seat at the table. Were it not for the relationship and collaborative thinking of a Special Education Director, we would not have been included. Now that MCC was committed, there was a real possibility this grant was going to get done, but it certainly was not a fait accompli. MCC wrote a one-year planning grant to convene the stakeholders of this grant, and the process began. We met every two weeks at MCC to discuss and plan the grant. This meeting was chaired by the State ICE Coordinator, Glenn Gabbard, and included the following MCC staff: Susan Woods, Dean of Student Support Services; Dawn Gross, ICE Coordinator; Pam Flaherty, Dean of Students; Phil Sisson, MCC Provost; Middlesex staff members; and adult agency services. It was a cast of thousands, but it was necessary to show that this was an important endeavor that needed the support of the community. There was a smaller planning committee that was developed, and we reported to the large group on the progress that was being made. These meetings were not all smooth sailing. There were many snags and problems that needed to get worked out if this grant was going to get written. What I learned was that being on campus at MCC was not any different than being on campus at one of our host schools. LABBB was developing relationships with MCC staff during the grant planning phase. We met with many agencies, including Think College, and we were discussing best practices in education. We were interacting with adult agencies that were supporting this initiative, and also UMASS Lowell, which was also interested in how this was going to work out. MCC and UMASS Lowell have a relationship where students who graduate from MCC can go on to finish their four-year degree at UMASS Lowell. We even met a few MCC professors who knew LABBB students or had a niece or nephew who attended LABBB. Had it not been for these relationships, the ICE grant would never have happened, and it certainly would not be as successful as it is today. There was a point during the process when we could not picture what the students would be doing during the day when they were on campus at MCC. Many others agreed, and we looked to other established ICE programs in Massachusetts. We learned that each ICE program was unique—from its establishment to its function. Therefore, it was unclear how the LABBB/MCC ICE program would operate. Denise Oldham and I decided to take some time to brainstorm how we would explain the ICE program to parents. It was time well spent as we ended up constructing the ICE Experience diagram. (See diagram below.) We did not want the program to focus merely on a student taking a class and then leaving; it needed to be a true college experience. When we first started the program we agreed that we would start with students from Bedford who attended the LABBB program, since Bedford and LABBB were working together on this grant. We spoke with parents from our Bedford High School program and we wanted to start with a small cohort of students. Next, we needed to hire an educational coach. This person would be working with our students every day on the college campus. We hired Steve Pierce, who was an educational coach for Westfield and part of the ICE program at Holyoke Community College. We could not have found a better person to work with. He really has done a tremendous job in building the ICE program at MCC and deserves the credit for this. Yes, for the first semester, we were going to fly the plane while building it. There were many unknowns. But, we realized that we were going to learn from our mistakes, and that this program was going to happen, as the ICE Grant was accepted in late July 2014. The fall semester was coming quickly and we were quite nervous about how this was all going to work out. Many questions came my way that I was unable to answer as we had never done this before. We felt confident, however. We had an experienced educational coach and a strong relationship with MCC. We truly enjoyed working with the people around the table. Dawn Gross, ICE program Coordinator at MCC, met with all the parents, registered the students for classes, and planned the welcoming day and visit, which was a great opening. We arranged for transportation to be provided from Bedford High School to MCC for students who were enrolled. Interestingly, after the first few weeks, the students wanted to exclusively use public transportation and did not want any part of our door-to-door service. The students saw themselves as being independent. They were college students, and college students take public transportation to and from school on their own. For the rest of the year, and right through the winter, all the students were travel trained as part of the ICE program and took the MBTA and MCC shuttles to school and back to Bedford High School. The first semester was a big success. Glenn Gabbard, State ICE Coordinator, has been using our model as an example when he talks to other districts that are interested in the ICE program. We have been asked to conduct many panel discussions with other communities looking to start the ICE program, and we were the first collaborative to do this, so it was quite unique. For the spring semester, we decided to open up the ICE program to other students outside of Bedford, and three more students expressed interest. We now have a total of six LABBB students enrolled in the second semester of the program. MCC also has a Transition program that they have had for 25 years. This is quite different from the ICE program, but the nice part about this is that if a LABBB student goes through the ICE program, and wants to apply for the Transition program after graduation, this would be a natural process. We have one LABBB student who will go through the ICE program this semester, graduate in June, and attend the Transition program in the fall. When we first started the program we set a duration of time that the students would be on campus. We first planned for students to be on campus from 9:00 a.m. to 12:00 p.m., but it turned into a much longer day. The students now arrive on campus at 9:00 a.m. and return to school about 2:00 p.m. We have students on campus every day, and classes run either T/Th or M/W/F. Along with attending their class, a student might go to the fitness room to work out; join a club; play foosball in the student center; eat lunch in the student cafeteria; go to the library to study; check their e-mail; organize their work; access the student disability office; check in with the educational coaches and the MCC ICE Coordinator; and participate in or attend any special activity that is going on during the day. The students audit courses, but they work extremely hard. The educational coaches expect that they will participate to their full potential. The students do have the option to take tests or take the class for a grade. Building communities and relationships is essential if you are part of a collaborative. We build communities to support our students, to help raise awareness of what our students are capable of, and to help our students get their foot in the door to prove they can be a valuable asset to the community. Each of our host buildings and worksites are a community. What does this create? Opportunities. We have built a community at MCC, and future students who enroll in LABBB will have the chance to attend if they want. When I visit MCC, I proudly observe that our students have a place to go where they get support. I am pleased to witness that the MCC staff knows our students, and that we are a natural part of community life at MCC. Furthermore, many LABBB students have graduated and attended the Transition program at MCC. The ICE program can be a vehicle to help them experience college life before making this decision. On the first day of school, we all attended the block party. The students had a blast and enjoyed every minute of the day. We met MCC staff, visited with the President, and took many pictures. We were sure to explain to the ICE students that this was not going to happen every day in college. A few days later, an MCC student approached our educational coach and asked about our students and their involvement at MCC. She did this on her own volition and ever since, she has been a peer mentor for our students. There are some extraordinary people in this world and this young lady has proven this. She is still involved with the ICE program and has become a friend and a voice for our students. We struggled with the grant criteria during the grant writing process. The grant language stated that a student can participate if they have severe special needs and if they have not passed the MCAS. This applies to students under the age of 20. If a student is 20 or older they will be eligible for the ICE grant if they passed the MCAS. We had our first meeting to discuss the writing of the grant for the second year, and this will be addressed. We are eager to know if this language will change. How Does a Student Become Part of the ICE Program? When we first started this program we had difficulty finding students. It was a new program, and we could only speak to the vision of the program. We were fortunate that we had some parents who were interested, but they were quite nervous. We met with the parents to discuss what we had learned and what our plan was for this experience. When the ICE program got up and running the parents were extremely impressed and found it be a valuable experience, and they all signed up for the second semester. It exceeded our expectations! I have to give credit to our educational coach, Steve Pierce. He is an innovative thinker who believes our students can accomplish anything they put their minds to. He challenges the students and the parents to do more and take risks. He deserves recognition for building this program. If you hear of a parent or student who is interested in the ICE program, please tell your respective program coordinator or director. We will contact the parents and give them information about the ICE program. The MCC ICE Coordinator will also meet with the parents and talk with them. Interested students and parents can also visit MCC. We recently arranged such a visit for a student who will be attending in the fall. We do need to get the district’s approval if a student is going to be enrolled, as they are considered dually enrolled in LABBB and MCC, and this must be reflected in the IEP. Last month, I attended our Parent Advisory Group to talk about the ICE program. Susan Woods, from MCC, also attended, and it was a great meeting. I told the parents that they should contact their respective program coordinator or director if they have more questions and let them know of their interest in having their son or daughter attend. We are learning every day, and this program will continue to evolve. We plan to have about 15 students enrolled in the program in the next few years, but we want to build slowly. Please call or e-mail if you have any questions regarding the ICE program. We will do everything we can to communicate our progress. What a wonderful reflection. 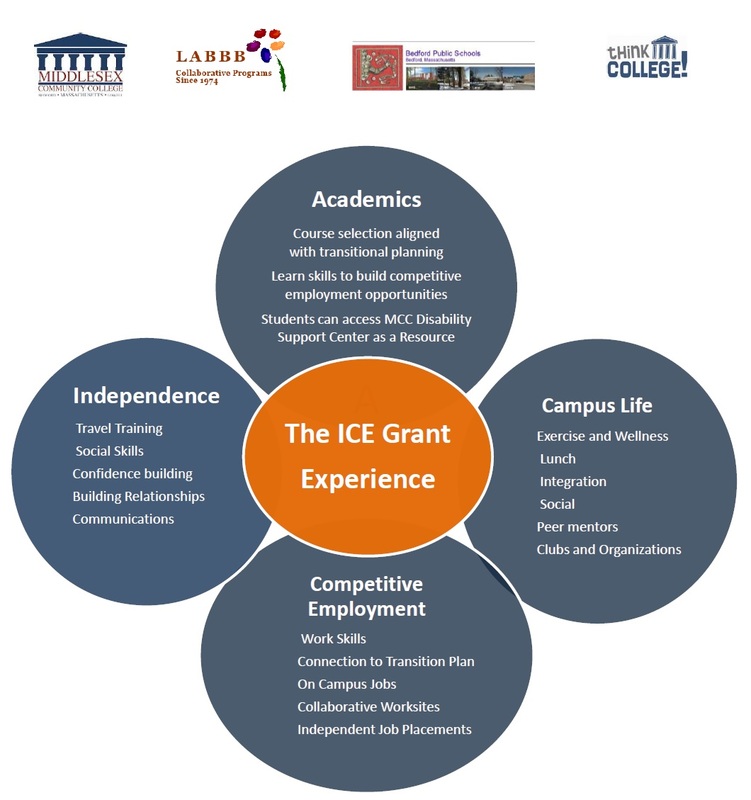 The ICE Grant has been so successful because of the LABBB Partnership. MCC was originally hesitant about attempting to implement the ICE grant based on the criteria and some of the missing service components. With the team that came to the table we were able to provide everything that we believed would help make a student successful. The team re-worked the model and expectations. The key component was having a special education collaborative as part of the team, which makes this model unique and a best practice. Thank you to Ann Guy, Bedford Schools, MCC faculty & staff and LABBB Collaborative for developing a unique student success model for a population of students who otherwise may not have had the opportunity to experience college success. – Pam Flaherty, Chief Student Affairs Officer – Middlesex Community College where Everyone Teaches, Everyone Learns.